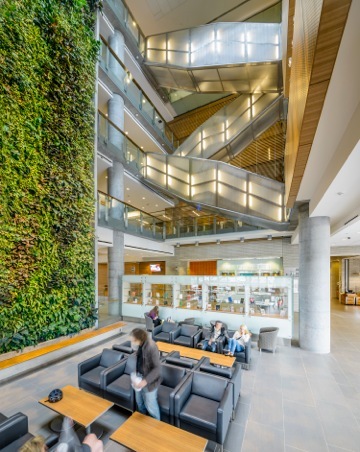 The Ottawa Social Sciences building contains a large living wall in the atrium, for students and visitors alike to congregate around. In today’s commercial interiors, it is vital that spaces for workers, visitors, and suppliers exude a welcoming, vibrant, and ‘dressed for success’ ambiance. Living plants can be a much-needed component of any commercial building’s interior design, as they have the innate ability to naturally transform the space. From creating positive first impressions, improving people’s overall productivity, and giving a fresher and cleaner appearance, plants in the commercial workplace are important. Those knowledgeable of commercial construction probably agree with Wright’s assessments. Bringing the beauty of nature indoors is positive. Additionally, there is a huge focus on creating buildings offering ‘clean air.’ As a result, the esthetic appreciation and overall energies people glean from being surrounded by lush green indoor plantings are byproducts of having healthy, clean air inside. Indoor air can be filled with gaseous contaminants that arise from building materials, furnishings, activities, and the occupants themselves. These contaminants can accumulate and potentially harm those inside the structure. How does a living wall biofilter clean the air? It is important to remember it is not the plants, but the microbes growing in association with the plants (i.e. on their roots, surrounding media, and in the water) actually cleaning the air. Although these same microbes exist in the soil of typical potted plants, the fact they are encased in soil and further encased in a plastic pot means these soil microbes have little opportunity to impact indoor air quality (IAQ). What other benefits does a living wall’s esthetics offer? Scientifically speaking, many research projects have continued to prove that greening the commercial workspace reduces stress levels of people inside, increases their productivity, and reduces absenteeism. Can a living wall biofilter actually save a building’s owner money? Most commercial buildings are ventilated with new outside air to avoid the buildup of harmful pollutants. This air must be heated in the winter and cooled in the summer, which can represent over 30 per cent of the overall energy consumed by the building. A living wall biofilter (when integrated into a building’s HVAC system) can replace a significant portion of this entire fresh air intake. The returned clean air is already at the right temperature and desired humidity—eliminating conditioning. By avoiding the energy expense of heating, cooling, and conditioning outdoor air, these biofilters can potentially pay for themselves in as little as three to five years. With careful planning, savings can be immediate. For example, the aforementioned six-storey living wall project at the University of Ottawa was designed by Diamond Schmitt Architects to provide all of the building’s humidification, which eliminated the capital cost of that equipment piece. Whereas most green walls serve a purely esthetic role, the visual appeal of these biofilters is simply a byproduct of its inner workings. The more important functions of providing clean air and improving building performance offer measurable and sustainable benefits to owners and occupants alike. Ron Treister is the president of Communicators International in Jensen Beach, Florida. 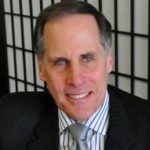 He has more than 20 years of experience working with the building and architectural design communities and has written for various construction publications. Treister can be reached at rlt@communicatorsintl.com.